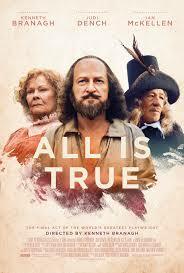 Review: This film is set in the year 1613 and looks back at the final days in the life of renowned playwright William Shakespeare. He is acknowledged as the greatest writer of the age. Disaster strikes when the Globe Theatre burns to the ground. Devastated. Shakespeare returns to Stratford-upon-Avon, where he faces a troubled past and also a neglected family. Having only one son, Hamnet, he is still haunted by Hamnet’s death at the age of 11 and fights to mend his broken relationships with his wife and daughters. He searches for the truth and uncovers secrets and lies within a family at war. Dear readers, before I start on this film review I thought you might like to know that this is my 900th film review! What better way to celebrate than to review the incredible All Is True. Also great to have a film starring Kenneth Branagh, Judi Dench and Ian McKellen in. I found watching the trailer for this doesn’t do the film justice. Written by Ben Elton. I really enjoyed this film. It was really unusual. This is a story in which I knew nothing about. I think Kenneth Branagh is amazing and love his voice. I can listen to him reading the telephone book and he would make it sound interesting. I have really enjoyed the films he has directed, such as Cinderella (2015) and more recently Murder on the Orient Express (2017). I love Ian McKellen’s cameo part as the Earl of Southampton, but as you may know, I am a huge fan of Sir Ian. It was just a shame he wasn’t in it more. I do feel that the scene with Shakespeare and Earl of Southampton was played well and very sincerely. There was no over the top acting and the scene didn’t go on for too long which it could have done. Sir Kenneth Branagh has said that the cinematography for the interior scenes was done using only candlelight. Judi Dench was perfect playing Anne Hathaway and can’t think of another actress who could have done that part so well or convincingly. I found the whole film to be very touching and moving at the same time.